Classic hummus. Flavoursome organic ingredients whizzed up into a rich, satisfying dip. Buttery chickpeas, nutty tahini, zesty lemon and a hum of garlic, plus the best cold-pressed olive oil – with a deep green drizzle of oil on top, too. Slather onto oatcakes, or get dipping with warm pitta and crunchy raw veg sticks. Keep in the fridge and use within 2 days of opening. 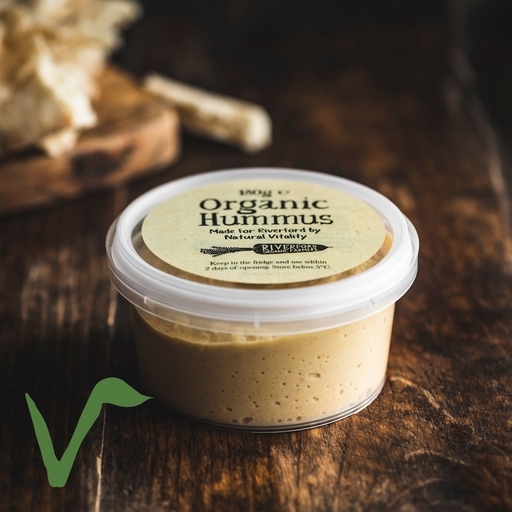 This organic hummus is made for Riverford by Natural Vitality, an award-winning small producer based just outside Bath. Mark, Ayleen and the rest of the team at Natural Vitality are obsessed with hummus: it’s the only thing they make. They personally source the best organic ingredients, make the hummus by hand in small batches, and taste each batch to make sure it’s just right. Chickpeas (68.4%), filtered water*, extra virgin olive oil, lemon juice, tahini (sesame), garlic purée (garlic, citric acid*), sea salt*.